Is There Political Will Towards Democratization in Cuba? The concept of political will can be applied to any context where actors in a political environment vary in their commitment and ability to attain a particular objective. The objectives in question can be comprehensive or non-comprehensive and they can be objectives independent observers view positively or negatively. In this analysis we will focus on democratization, which is a comprehensive objective, keeping in mind that in any particular application actors that make up a government may be trying to reverse rather than to deepen a democratization process. We will develop first the general concepts associated with this issue and, subsequently, we will apply them to the Cuban situation. Economists tend to describe evaluations of the feasibility of exercising political will in terms of the political economy of reforms while political scientists tend to do so in terms of the political will to reform. Policy makers, practitioners and the media often use these terms or similar ones interchangeably to discuss the viability of policies. We will use the term political will to describe a government’s commitment to pursue a particular objective, recognizing that the government is not a monolithic entity. Based on literature from both political science and economics, this paper develops a conceptual framework for evaluating the political will to further or reverse democratization. The first section provides a precise definition of political will applied to democratization and its main implications. The second section identifies the potential actors and the principal dimensions of their preferences relevant for evaluating a democratization process. The third identifies the general nature of the constraints faced by these actors, including their capacities. The next section discusses observability and measurement issues, identifies five major factors that determine the political will to democratize and proposes outcome indicators of this political will to democratize in the context of a prototype model. The last section applies these ideas to the Cuban situation. POLITICAL WILL TOWARD DEMOCRATIZATION: WHAT IS IT? It is useful to start with a general definition of political will and what it implies before focusing on measuring this concept in any practical context. In this section we start with a simple but general definition and we draw out its implications at an abstract level. For our current purposes political will is a government’s commitment and ability to act in the furthering or the reversal of a democratization process. Of course commitment and ability are two different dimensions, which will become clear in subsequent discussion. First, commitment is determined by the preferences of the actors that are the main components of a government toward democratization or its main elements relative to their preferences for other objectives. In other words, the degree or intensity of commitment may vary. These preferences can be affected by beliefs and desires as well as interests. We take them as given. Second, ability is determined by the constraints faced by each of these actors and their capacities to act individually as well as collectively. At the time of measurement it is useful to differentiate the transactions costs of engaging in collective action from the political prices or political costs that may appear in the constraints faced by different actors. Of course, they both matter. Third, any particular implementation of this approach suggests identification of the relevant actors, their preferences toward democratization or its main elements, the constraints each one of these actors face and their capacities to act. In any society there are a number of potential actors that could play a role in determining outcomes. Hence, in any specific analysis of political will it is useful to identify the main actors in the society as well as the preferences relevant for this particular application. In principle they are: (1) the military, including factions; (2) the executive, including bureaucracies; (3) legislatures or parliaments as institutions and the political parties that make them up at a point in time; (4) the judicial system and any other institutions that impact the operation of the legal system,; (5) civil society and other institutions that may affect the level of popular support for an activity, for example the media; and (6) the private sector and special interest groups, including actors that may be external to a country in some contexts. While all of the above actors would be relevant for democratization in principle, because it is such a comprehensive objective, the importance of some of them would vary with the context. For instance, they could vary with regime type in the particular country of application at the time of analysis of the democratization process. Similarly, even the classification of some participants as actors or constraints may vary with the particular country of application. Each one of the above potential actors has preferences or basic objectives that they desire, and which they can perceive as consistent or inconsistent with the goal of democratization in any specific analysis of political will. Preferences for each actor usually have several dimensions. At this abstract level it is easiest to consider for each actor only two broad dimensions of preferences: self-interest or its elements, especially economic ones, and democratization or its elements. By and large we will view the first dimension as primary, in the sense of being given greater weight in any decision, and the other one as secondary, in the sense of having a smaller weight. In a particular application one may want to consider more than one element of selfinterest, for example preservation or improvement in an actor’s current position in terms of staying in power or income. Of course, the elements of self-interest may vary across actors or countries. With respect to the secondary dimension of preferences, however, the opposite is the case. Since it is the focus of our analysis of political will, it is useful to be specific on what we mean at this point. Since the level of this dimension is evaluated numerically on an annual basis, it is an especially attractive measure. Note that this is strictly the case since 2006 at this level of aggregation, but it is also true for the last 40 years as part of the aggregate political rights index. Benyishay and Betancourt (2008) provide a procedure for estimating past values at lower levels of aggregation using these two pieces of information for the civil liberties index and one of its components. The same procedure can be used here. A second dimension of democratization is the protection of human rights. Many of these rights, for example freedom of speech and freedom of assembly, are part of the Bill of Rights.3 In the literature, e.g., Kaufman (2005), these rights are often referred to as first generation human rights and contrasted with second generation human rights. The latter would include, for example, economic rights associated with geographical or employment mobility and property rights. Both sets of rights are also measured by Freedom House (2006) under the label of civil liberties. There are also other measures, for example Blume and Voigt (2007). The level of these human rights can also be evaluated numerically in all systems, i.e., democracies and non-democracies, on an annual basis. There is a third dimension or aspect of democratization worth keeping in mind. When captured in one word, it is best referred to as legitimacy. What we mean by this concept is that the governed accept or reject the right of the regime to govern for one or more reasons. This concept in general terms has become standard in the political science literature, for example Dogan (2004). Diamond (2008) uses it as a matter of course and without explanation. In our case we will note three aspects of legitimacy that may be especially relevant in particular cases without claiming to be exhaustive. These aspects are the presence or absence of economic performance, political competition, and effective delivery of public goods (these can include basic services as well as sovereignty in the form of full control over national territory). With respect to this third dimension its composition in terms of conceptual aspects as well as the measurement of many of these aspects is more controversial. Hence, it is easiest to introduce relevant aspects that can be measured as modifying factors in determining the levels of the first two dimensions of democratization. Each one of the above actors faces constraints of various kinds in pursuing the objectives in their preferences. We first describe the general type of constraints on democratization that apply in all contexts. Subsequently, we discuss the ones that are inherently dependent on the characteristics of specific actors, which we call capacities. Some constraints are in the traditional form of limits on time and other resources needed for attaining the objectives in a decision maker’s preferences. These constraints are similar to the traditional constraints of elementary economics and we will label them traditional. One issue that arises in the context of interactive constraints is whether the analysis should be undertaken at the national level or at a lower level of aggregation. This can happen because there are administrative considerations that affect the level of political will toward democratization. For instance, provinces and municipalities can exist as mere accounting devices or as actual wielders of economic and political power. The issue of decentralization of political and economic power and its impact on democratization is likely to vary widely among countries everywhere, and even over time in the same country.5 Thus, its importance and how to incorporate it into the analysis needs to be ascertained in the particular context of the analysis. Finally, some constraints involve factors that are external to actors in the system of government or to their interactions but that can affect the outcomes of interest, for example, other countries, religious beliefs, ideologies, size, geography, and demographics. We shall call these constraints environmental. They also help identifying other limits and sources of power. The classification of constraints into one of the three types above is merely a simplifying or cataloguing device rather than a rigid taxonomy. For instance, in some countries religious beliefs or geographical divisions along ethnic lines may play the role of interactive constraints rather than external ones. In these cases it is also likely that an evaluation of political will is best done at a sub-national level. In other cases, actors external to the system of government inside the country, for example other countries, may play such a dominant role in affecting political will to democratize that they should be viewed as additional actors providing interactive constraints rather than as external constraints. The taxonomy is merely a device that forces an evaluation of the extent of the role of each factor in determining political will. The perceived capacity of an actor or actors to act, individually or collectively, is also affected by characteristics of the actor or actors such as education, religion, ideologies, and visions of the world. These capacities could be viewed as an additional type of constraint. But it is useful to single them out separately. In contrast to interactive and environmental constraints, this one is internal to the individual actor or group. In contrast to the traditional constraints it reflects limitations other than access to time and money. These limitations lead to heterogeneity in the actors’ choice sets. That is, the ability to undertake certain actions will be influenced by these capacities. Explicit mention should be made of the capacity to act collectively. The ability to engage in collective action by any actor or group of actors varies with the issue (for example number of people who enjoy the benefits or pay the costs), and the circumstances of the society (for example, the extent of social capital). It can also have an important impact on the extent of political will. Perhaps the best way to capture these collective capacities is in terms of the transaction costs faced by each actor while engaging in collective action activities. That is, the actors with greater capacities can be characterized as facing lower transaction costs while engaging in these activities. Ironically, one of the determinants of these transaction costs is the extent of political and civil liberties prevailing in the society at any one point. For instance, if there is no freedom of speech or assembly the costs of transmitting information and organizing to engage in collective action will be much higher that when there are high levels of freedom of speech and assembly. Fortunately, we now have measures of the levels of these freedoms across a wide variety of countries based on the persistent efforts of Freedom House. Thus, the transaction costs of democratization will depend on the previous level of this dimension of democratization. 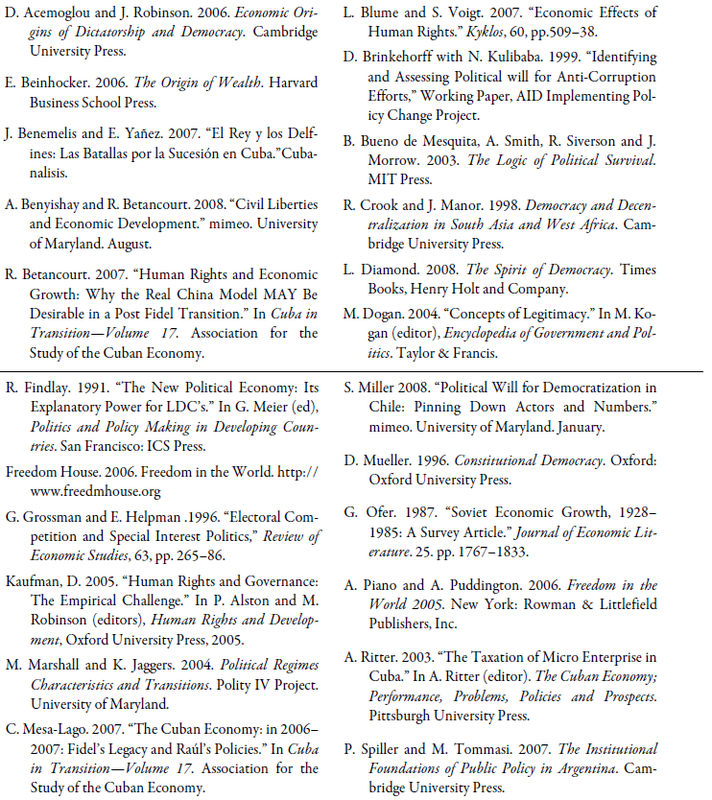 In this section we begin to move toward practical considerations in two ways: first, we consider general observability and measurement issues to be confronted as a result of the nature of the problem as well as of our conceptualization; and second we develop indicators of main determinants of the political will for democratization in terms of the previous considerations. Considering the potential complexity of determining political will as illustrated by the previous considerations, measurement will be a difficult problem. Part of the difficulty is the lack of direct observability of some of the basic concepts in the previous formulation. For instance, preferences are not directly observable. Only the results of actions guided by these preferences will be directly observable. Since some of the basic concepts determining political will are not directly observable, it follows that political will is not directly observable. In view of this characteristic of political will, we will proceed by using the previous discussion to: (1) identify the main outcomes or indicators of a political will toward democratization; (2) identify indicators of the main determinants of the political will toward democratization; and (3) suggest the nature of the relation between democratization and the main determinants of the political will toward democratization. Before doing so, however, we will consider some measurement issues arising from the complexity of the framework and on which we can make progress at this stage. First, in any particular application some of the many factors outlined above will affect political will toward democratization positively and others negatively. Hence, whatever measure one uses as an outcome should be able to take on a range of values as opposed to a dichotomous one. Thus, we will focus on measuring the extent of the political will to act in any particular application rather than on a single yes or no answer as to whether there is or there is not the political will to act. Second, our focus is on a government’s political will to act at a point in time. This feature could lead some to want to consider explicitly the type of regime that exists in the government whose political will toward democratization one is trying to measure. Doing so, however, would lead into a discussion of a classification of democracies and non-democracies and possibly of further refinements within each category that is likely to be unproductive. For instance, one simple regime distinction with respect to the type of democracy is whether it is a presidential system or a parliamentary one. Mueller (1996) has argued that constitutional democracies with parliamentary systems can generate political parties with national constituencies and more dispersed interests whereas presidential systems can generate political parties where the legislature represents narrow local interests and the national interest is left to the executive. The applicability of this distinction in Latin America, however, is far less clear cut than when comparing the United States and Europe. Similarly, a simple regime distinction suggested by Findlay (1991) with respect to non-democracies is traditional monarchies, traditional dictatorships, rightwing authoritarian states, and left wing authoritarian states. The legitimacy of these regimes with the general population can vary considerably with the type of regime and it is one reason why the classification can be useful. On the other hand, monarchies are irrelevant in Latin America. Furthermore, this is not the only possible classification and it is not well known or widely accepted in the political science literature. Rather than use an explicit classification of regime types, we will try to capture relevant dimensions of such a classification with specific variables when applicable. For example, one important reason for interest in such a classification is the extent of separation of powers in a society. One measurement of this concept that is widely use is Polity IV’s Constraints on the Executive variable. It evaluates both democracies and non-democracies in this dimension. It ranges from 1 to 7, where the highest number indicates the greatest subordination of the decision making authority of the executive to other groups, Marshall and Jaggers (2004). This index is available for many countries and for many years for each country. In practice it can be especially useful in the measurement of interactive constraints. Brinkehorff and Kulibaba (1999) in their working paper on identifying and assessing political will for anticorruption efforts identified five broad factors that determine political will for anti-corruption reforms. We adapt each of these five factors for the analysis of political will toward democratization. This is accomplished by formulating these factors as determinants of political will in terms of the previous discussion. Locus of Initiative or Main Actors and their Preferences. In terms of our framework above, this dimension means ascertaining, in any particular context, who are the actors pushing for or against democratization, and making a judgment on the intensity of their preferences toward each of the aspects of democratization identified above relative to their self- interest. For each relevant actor in the applicable regime type a score of 1–76 could be given indicating the strength of alignment of their preferences with each of our two main dimensions of democratization: fairness of elections and civil liberties. Degree of Analytical Rigor or Capacities and Traditional Constraints of the Main Actors. In our framework, this dimension means ascertaining the capacities of each of the actors in the locus of initiative to pursue each of these elements of democratization. For each relevant actor an evaluation of their capacities to act for or against each of these elements on a similar scale of 1–7 can be provided. There could also be an evaluation on the same scale of their traditional constraints in terms of time and resources in acting for or against the main dimensions of democratization. These two evaluations can be merged into a single one in some cases. The score on the capacities and the constraints can be added using equal weights for each actor when both are available. Mobilization of Support or Other Actors Playing the Role of Interactive Constraints and Factors and/or Actors Playing the Role of Environmental Constraints. In our framework this dimension means ascertaining the extent of support for or against the main elements of democratization by all the actors that are not directly involved as the locus of initiative. That is for actors participating as interactive or external constraints an assessment of support for or against each element of democratization can be provided in a scale of 1–7. Any factors not associated with one human agent or actor that plays the role of an environmental constraint can also be evaluated on a similar scale as well as variables that can serve as indicators of collective support among different actors, reflecting the extent of unification and organization. Application of Credible Sanctions or Assessments of Political Costs of All Actors Identified in Items 1–3 Above. In our framework this dimension means ascertaining the political costs to all of the actors in acting for or against the elements of democratization. Economic costs are already included directly in the traditional constraints. Hence, these political costs reflect direct non-economic consequences for an actor such as loss of power or prestige not included previously. For each relevant actor in the locus of initiative or as a constraint this assessment of the political costs can also be provided on a scale of 1–7. Alternatively, if one finds sensible measures of political costs for classes of agents in a particular country these can be included here or as moderating factors that we label below as Z variables. Continuity of Effort or Assessment of the Permanence of the Variables in the Previous 4 Items. In our framework this dimension means an evaluation of the extent to which each actor is committed to reverse or deepen the main elements of the democratization process over the indefinite future. It is in the evaluation of this dimension that a prior history of support or rejection can be given special attention. For each relevant actor an assessment of this commitment to each dimension of democratization can be provided in a scale of 1–7. Alternatively, if we are able to identify variables that capture items 1–4 on a periodic basis, for example a year, we can construct indicators of permanence over the period of analysis for any particular country. General Comments on the Determinants of Political Will: (a) Each of the five items above provides an evaluation of an aspect of the political will to democratize with respect to each of the two main dimensions of democratization identified in the conceptual framework. (b) A subtle implication of our approach is that, for example, our view of mobilization of effort is designed to capture extent of support at a point in time rather than the ability of the reform initiators to bring about support. This is done on purpose so that when a determinant is calculated at two points in time, as we propose, the change in the determinant is an indicator of that ability. The approach in Brinkerhoff and Kulibaba, by contrast, implies a once and for all measurement. (c) If in any particular context we have information on whether the actors identified above have exercised political will in this dimension before, higher or lower weights can be given to that actor in its contribution to any of the five factors in some modeling variants or an indicator of this experience can be introduced in other modeling variants. Based on the previous considerations we can summarize our argument in terms of a prototype model. While we are not committed to any one version of the model in terms of functional form or specific determinants to be included, it will help clarify and focus the previous discussion to identify the following features. We propose a multidimensional model because the view of democratization above is multidimensional. It has two dimensions of democratization, fairness of the electoral process and the level of human rights, as our main outcome variables for two very important reasons. First, political will toward democratization is not directly observable or measurable. In those circumstances, the next best thing is the level of outcomes obtained by exercising political will toward democratization that are observable and measurable. Both of these dimensions are important features of democracy and both of them can be readily measured with existing data sources. This is the minimum that needs to be explained by any model of political will toward democratization. They will play the role of dependent variables, Y1 and Y2, in what follows. Second, these two dimensions of democracy are widely accepted by political scientists and economists and they are capable of independent variation and in opposite directions. A single aggregate index of the two would obscure these possibilities and or require adjustments of one kind or another to compensate for this deficiency.7 Of course, one could ask why not more dimensions. Indeed, we argued that legitimacy is a fundamental aspect of democratization. Legitimacy will play a role in our analysis, which is why we identified it earlier, but not as a dependent variable indicating an outcome of the exercise of the political will toward democratization. First, while it is widely accepted as a concept in political science, it is not widely accepted as a concept in economics. Thus, it is controversial. Second, there is no widely accepted measurement device for this concept even in political science. Third, legitimacy itself can be thought of as having more than one aspect and not all of them are easy to measure as we saw above. Hence, we will use some of its components as determinants of political will but not as a direct outcome of exercising the political will to democratize. In sum our prototype model can be described at the abstract level in terms of the following two equations. The dependent variables (Y1, Y2) have already been defined above. Indeed, we have even indicated there how to measure them for any country and time period. The independent variables can be classified as follows. The X’s or X*’s correspond to each of the five factors that determine political will toward democratization in each of these two dimensions. The definitions of these five factors in terms of the relevant actors have been discussed in detail above. In contrast to the dependent variables, however, their actual measurement or evaluation is context dependent and needs to be done for each specific country that will be the subject of analysis.8 Incidentally, note that these variables are really vectors of variables. For example the set X1 would be (X11, X12, X13) for any country in which there are 3 main actors in the locus of initiative for the determining the first of the two elements of democratization. The Z’s are other variables that affect these two dimensions of democracy without necessarily being related to the determinants of political will directly. Prominently among these variables would be, for example, those that affect the legitimacy of a regime or an administration. For instance, this would be the case for economic performance variables directly or interacted among themselves or with other variables. Similarly, some of the factors acting as environmental constraints and not associated exclusively with an specific human agent can be included among the Z variables (religion, ideology, demographic characteristics) by themselves or interacted with other variables, including the X’s. The Y’s on the right hand side of the equations can be lagged values of either of the two dimensions of democratization that may affect the other one. They can also be current values because there is simultaneity in the model. That is, fairness of the electoral process affects the level of civil liberties or vice versa. None of these variables on the right hand side need to be the same in each equation, although they can be in some cases. Thus, the notation is chosen to stress that they are allowed to be different. Both equations hold at a point in time and the time subscript has been omitted for simplicity. All of the symbols for variables on the right hand side of the equations are to be interpreted as vectors, i.e., in principle they represent a set of variables. An application of these ideas to Cuba’s current situation can proceed at many levels. We illustrate two of them. First, we will consider the relevant actors, and perceptions of their preferences and constraints along the lines summarized in the previous section. Second, we will report on a survey designed to elicit the views of key actors toward the two outcome variables emphasized in the prototype model presented above. In Cuba the main actors in a move to democratize would be the military and the Communist party bureaucracy. Legislatures and the judicial system have little influence other than as rubber stamp mechanisms. Civil society institutions are weak by design and the ones with an autonomous influence, the dissidents, are frequently persecuted by the current regime. The private sector is quite limited. The self-employed are limited in terms of occupational activities, ability to hire anyone other than family and subject to a confiscatory tax regime (Ritter 2003). The joint ventures and “sociedades anónimas” are normally composed at the top of former military officers and Communist party bureaucrats. Foreign investors must hire employees from a National Employment Agency, which is the one that pays workers (in pesos at the official exchange rate) while the Agency receives their salaries (presumably in foreign currencies or close to their equivalent at the black market rate) from the foreign investors. There is no independent media and only last March it became legal to buy cell phones and computers, but these are unaffordable for the majority of Cubans who are without access to substantial foreign currency assets or earnings. Some Cuban exiles would like to be major actors in the society but at present are unable to play much of a role, at least directly and openly. U.S. policy makers may have ambivalent attitudes toward democratization in Cuba, because of its implications for migration flows. That is, a democratic regime could increase the probability of a major migration outflow if unable to satisfy economic aspirations. The European Union has promoted human rights in ambivalent ways and is likely to limit its efforts to this area, espousing sanctions at times and economic engagement at other times. Venezuela and China, which are Cuba’s main trading partners at this time (Mesa-Lago 2007), would seem to have no interest in promoting democracy in Cuba. Similarly, Russia and Iran can play the role of environmental constraints at some points in the future, depending on their level of engagement with the current regime and the price of oil. Within the military and the communist party bureaucracy at least two factions have been identified: the hardliners and reformers. The former seem to prefer the current system with few changes and the latter are more open to economic reforms without political reforms, see Betancourt (2007) for a more detailed discussion of their preferences and traditional constraints. Neither group, however, has a strong incentive to democratize in terms of improvements in the electoral processes. Nevertheless, the reformers can find benefits in promoting some civil liberties. For instance, some civil liberties associated with second generation human rights, for example labor mobility, would benefit the success of some economic reforms. In some ways, the hardliners correspond to a faction in Cuba that Benemelis and Yáñez (2007) identify as the talibanes, who are associated with Fidel. But, they also identify the other main faction as raulistas and identifying them with the reformers is risky. While last year, for example, the so-called raulistas seemed likely to play this role, recent appointments by Raúl and the lack of serious movement toward meaningful reforms cast doubts on this characterization at the present time. In any event, the members of both factions identified by these authors come from both the military and the Communist Party bureaucracy. Environmental constraints can also affect the political will to democratize in Cuba in substantial ways. The hardliners are more in sync with Fidel than the reformers. They also have an easier time sustaining their positions if Chávez, for example, continues subsidizing Cuba. Hence, Fidel’s demise or Chávez policy turnarounds are circumstances normally beyond the control of either group that can affect their relative positions substantially. Similarly, substantial offshore oil deposits within Cuba’s territorial waters that can be obtained with technology available to Cuba, directly or through third parties, would alter the interactions between these groups as well as the strengths of their preferences for democratization relative to other objectives. Ironically, this particular event would decrease the political will to democratize for either group if they were firmly in control at the time the resources become available, by decreasing the economic benefits to democratization for those in power. One way of summarizing the previous discussion is that the political will to democratize, as perceived on the basis of standard social science analyses of this issue, is very low. Based on this perspective, one would attach a very low probability to the development of a democratization process in Cuba over the next few years regardless of what happens to Fidel or even Raúl’s health status. Nevertheless, it is useful to keep in mind two features of major changes in social processes. Our sample of interviewees included 28 individuals, men and women knowledgeable about current political conditions in Cuba. The interviews were conducted personally by Jorge Sanguinetty on the condition of double and absolute confidentiality. The questionnaires were not identifiable and the list of participants is and will remain anonymous. The confidentiality condition was essential to propitiate honest answers as virtually all interviewees are well known in Cuban political circles. An attempt was made to include residents in Cuba, both members of the opposition and individuals associated with the Cuban government. Nevertheless, only one questionnaire was returned from the island duly filled out. Many of the interviews were undertaken in person while others were carried out by phone. The questionnaire applied was identical, in terms of the type of questions, to one applied in a survey of Chileans participants: some of them were in the opposition to Pinochet’s regime and some of them were members of the government during Pinochet’s regime. All of them were active agents in the process that returned democracy to Chile in 1990 and are highly recognized personalities in the country’s political arena. The context was, of course, different since they were asked to answer these questions with respect to the situation that existed in Chile just prior to the 1988 referendum. This was helpful as a model because we had spent considerable time designing the questions for the Chilean survey. Incidentally, the Chilean survey was possible because the interviewer, Ms. Vivianne Blanlot, was herself a very prominent public figure in Chile—among her accomplishments is having been Minister of Defense under President’s Bachelet administration— whose promise of confidentiality was credible to the participants. The survey provides empirical information relevant for the conceptual framework developed to evaluate political will. We applied a structured questionnaire of 16 items with 5 possible answers each, to be graded from 2 to -2. The questionnaire was especially designed for this effort and was a Spanish version of the one presented in this text. 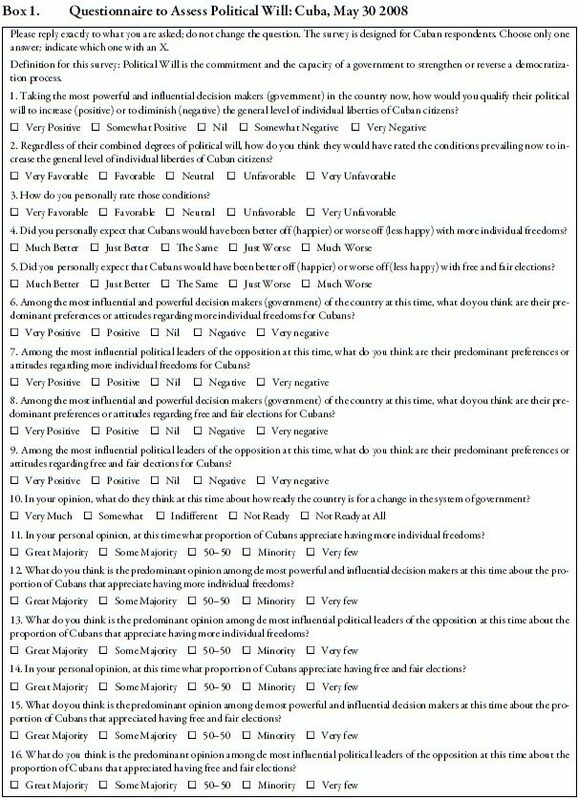 As there are great differences in perceptions about political will among participants previously affiliated with the government or with the opposition or who may have changed positions, in Chile as well as in Cuba, the questionnaire contains 16 questions addressing the interviewee’s perceptions about three kinds of actors in a possible transition ( government officials, members of the opposition, and the general public in Cuba) as well as the interviewee her/himself. Box 1 presents the questionnaire translated into English. The answers of the 28 respondents are shown in Table 1 according to a scale that moves from left to right with the corresponding values of: 2, 1, 0, -1 and -2. When one looks across the rows of Table 1, one finds that the mean answers to the questions, x, fall into 3 groups: (I) x < 0, questions 1, 2, 6 and 8; (II) 0 ≤ x < 1, questions 3, 10, 12, and 15; (III) x ≥ 1, questions 4, 5, 7, 9 11, 13, 14, and 16. Group I questions generated negative responses on average. The first three in this group (1,2, and 6) asked about the respondents perception of whether those in power in Cuba had the political will to increase civil liberties or believe that now was the right time to increase them, or had favorable preferences or attitudes toward increasing them. Interestingly, the last question in this group (8) asked the respondent for his/her’s perception of the preferences or attitudes of those in power toward free and fair elections. It got the highest negative response of all 16 questions by a wide margin (-1.3 average versus -0.4 for the next negative average). Thus, the respondents have widely different beliefs about the preferences or attitudes of those in power in Cuba toward these two different dimensions of democracy. Group II questions generated mildly positive responses on average. The first one (3) asks for the respondent’s opinion about whether now there are favorable conditions to increase civil liberties. The second one (10) asks for the respondent’s opinion as to whether or not opposition leaders think the country is prepared to change the system of government. The last two (12 and 15) asks for the respondent’s perception of the extent or proportion of Cubans that those in power believe would appreciate civil liberties or free and fair elections. In sum, the respondents believe that those in power are not in favor of either of these two dimensions of democracy, especially, free and fair elections, but believe that most of the population would appreciate them, especially civil liberties. Group III questions generated strong positive responses. The first two (4,5) ask the respondents if they think Cubans would be better off with more civil liberties and with a fair electoral process. Another two (7 and 9) ask the respondents about their perceptions of whether the most influential opposition leaders have positive preferences or attitudes toward civil liberties and a free and fair electoral process. Two others (13 and 16) ask the respondents about their perceptions of whether the most influential opposition leaders believe that most Cubans would appreciate more civil liberties and a free and fair electoral process. The last two (11 and 14) ask the respondents for their own opinion on whether most Cubans would appreciate having more civil liberties and a free and fair electoral process. 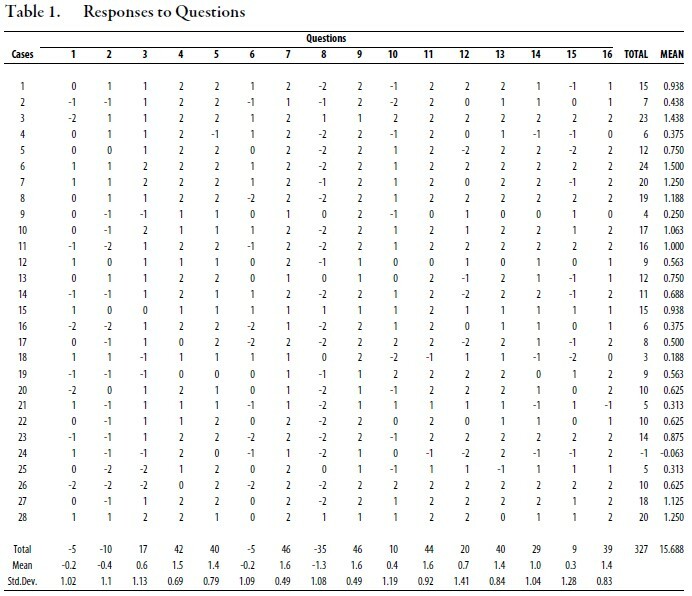 It is interesting that question 14 in group III had the lowest average score by a clear margin (an average of 1 versus an average of 1.4 for the next lowest average among the other 7 questions). It suggests that the respondents view civil liberties and free and fair elections as substantially different dimensions of democracy. They think that the benefits from the two dimensions perceived by ordinary Cubans on the island are different and, recalling the results for group I, the benefits perceived by those in power in the island are even farther apart. In their perception both classes of agents find civil liberties a more attractive dimension of democracy than free and fair elections. Ironically, their perception of what most influential opposition leaders in the island believe about ordinary Cubans views (questions 13 and 16) is different. In their perception influential opposition leaders think ordinary Cubans appreciate free and fair elections just as much as more civil liberties, in the sense that these two questions have the same average score. To conclude, suppose these respondents perceptions coincide with the views actually held by ordinary Cubans, those in power and influential opposition leaders. What can we say about the political will to democratize in Cuba? We can say that it is far more likely to manifest itself through an improvement in various forms of civil liberties than through a reliance on free and fair elections. Those in power have a strong aversion to the electoral dimension and only a very mild one to the civil liberties one. Ordinary Cubans have strong preferences for both dimensions, but substantially more for the civil liberties dimension than for the electoral process one. Finally, influential opposition leaders have an equally strong preference for both dimensions. 1. The authors would like to thank M. Pérez-Stable, T. Giannoni and N. Limao for comments on an earlier version without incriminating them for any remaining errors. 2. Indeed, this dimension has led to the development of organizations that monitor electoral processes in the last half of the 20th century. Some of these monitoring organizations are more credible than others. Furthermore, their credibility is an issue that has been well documented in press accounts of monitoring activities associated with the recent (December 2007) electoral processes in Russia and Venezuela. Nevertheless, monitoring issues will not be pursued at this point. 3. Most Latin American countries include these rights in the text of their constitutions. 4. For instance, the political economy model of Grossman and Helpman (1996) relies on game theory to analyze electoral competition in the presence of special interests groups. Similarly, Spiller and Tommasi (2007) adopt this approach as the underlying feature of their analysis of Argentina’s political system. One strand of political science literature has also adopted this approach, for example Bueno de Mesquita, et.al. (2003). 5. For instance, India is a very decentralized country and considerable economic power in the areas of health and education is wielded by the state governments. Within a state, at the district or lower administrative levels, however, there was little effective decentralization during the first 50 years of independence. This situation led to a number of constitutional amendments in the 1990s to standardize and promote effective decentralization within states, Crook and Manor (1998). 6. This scale is to be interpreted as follows: a score of 4 indicates a neutral effect on a democratization indicator; scores below a 4 indicate a negative effect on a democratization indicator; a score greater than 4 indicates a positive effect on a democratization indicator. Thus, higher scores can be interpreted as increasing the democratization indicator. We will use this same scale for every variable that is defined on the basis of a judgment. It promotes consistency while allowing for the main differentiations that are possible in this setting. 7. Acemoglou and Robinson (2006) use a single variable to capture the level of democracy and are forced into these adjustments, by supplementing their main measure (the Freedom House index of political rights) or by using an alternative measure. 8. We found insightful an earlier exercise by Sebastian Miller (2008), who applied these concepts to the case of Chile using our approach. 9. These abstract characterizations ignore subtler distinctions that can affect outcomes in practice. For example there are generational differences within these groups as well as within opposition groups. 10. Ofer applied a standard form of productivity analysis to data from the Soviet Union between the 1920s and 1985. A systematic decline with negativity productivity estimates in the later periods suggested the inevitability of substantial changes in the system. 11. A third mechanism would be a historical analysis of the revolutionary process relying on the concepts put forth here, but that would take us too far afield.